Yellow Bomarea - Bomarea superba? This is a close look at an amazing Yellow Bomarea. Bomareas are vines related to Alstroemeria, the "Peruvian Lily" seen in flower arrangements. 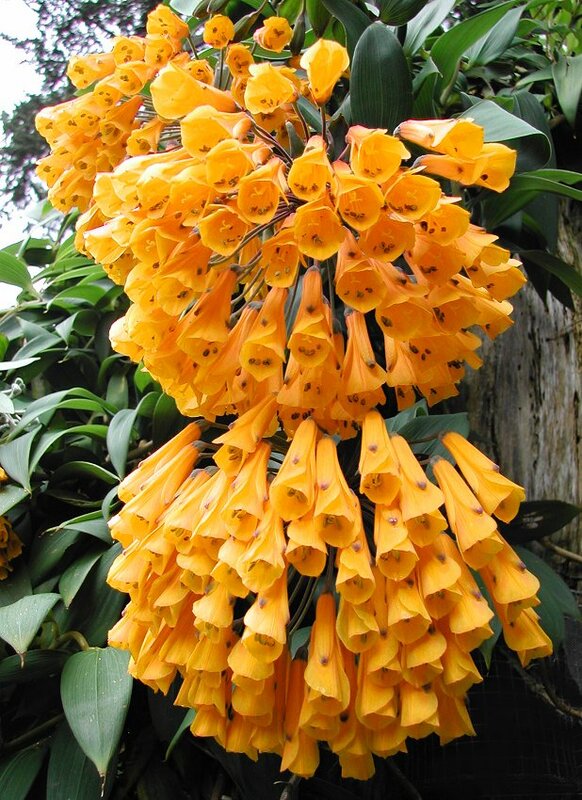 This Yellow Bomarea puts on a spectacular display of golden-yellow blooms all year long. Each cluster has dozens of 2 inch flowers - up to 70 in all! The species name is uncertain. Most Bomareas are cool-climate plants, and this one is untested in warmer conditions. It is extremely rare in cultivation, and seldom seen for sale. 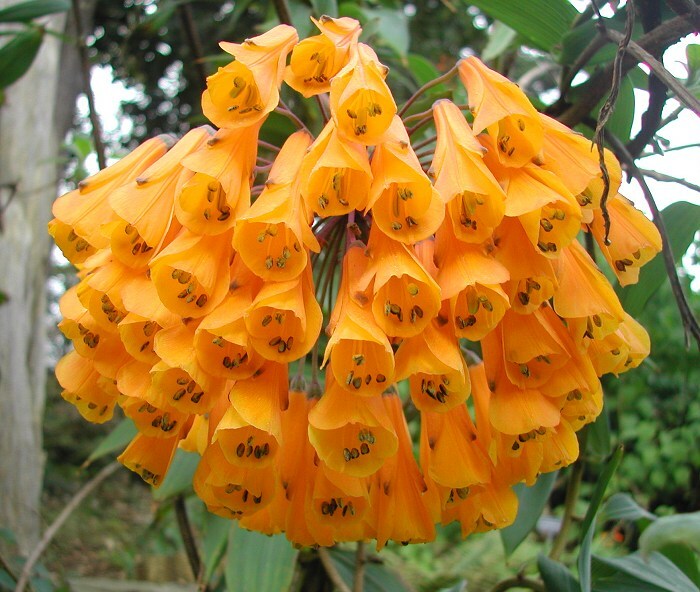 The Yellow Bomarea is a tuberous vine with attractive foliage resembling bamboo leaves. The shoots grow 10 to 15 feet long, although they may be kept shorter. A mature vine can bloom most months of the year, with several clusters open at a time. 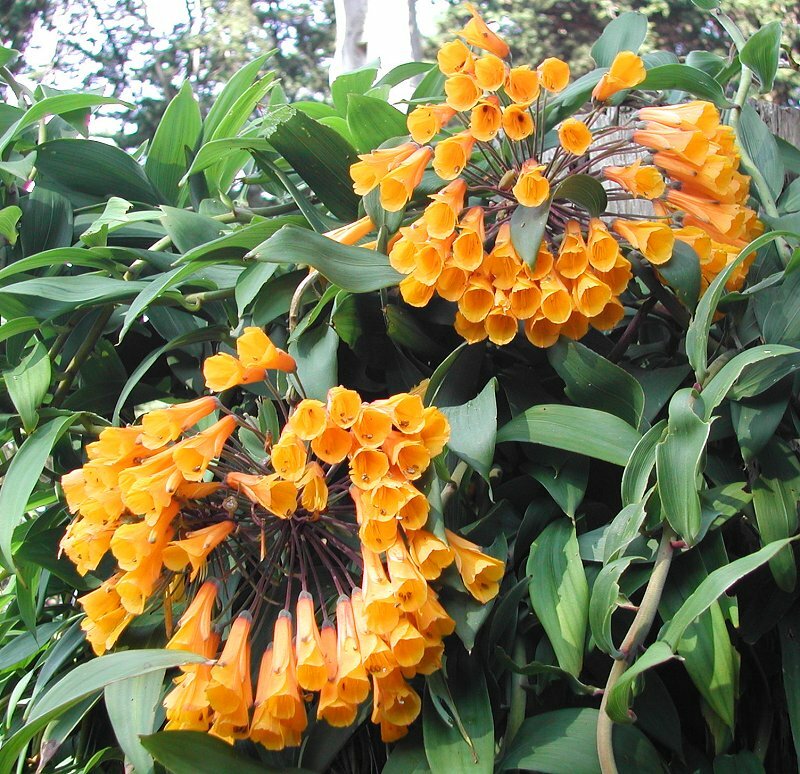 The plant is unusual among Bomareas both for its yellow coloration, and for the lack of spots on the inner petals. It has been called Bomarea caldasii, however i believe it is Bomarea superba from Peru. Regardless of its name, it is certainly one of the most beautiful of all highland vines. Unfortunately i don't know the climate tolerances of this plant. 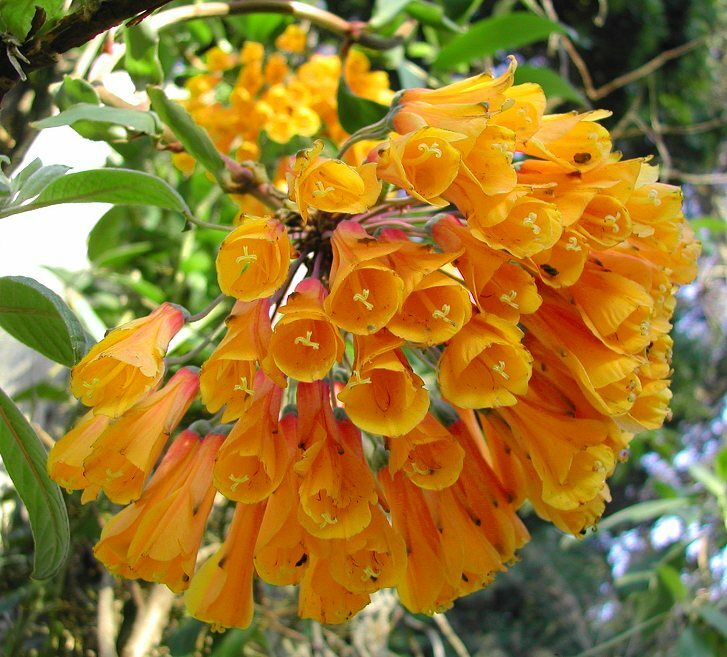 Most Bomareas come from cloud forests of the Andes mountains, where temperatures are mild all year and nights are cool. Most Bomareas don't thrive in hot climates, especially if nights are warm. It's possible that this plant will not perform well if temperatures consistently get above 85° F (30°C) and nights are above 65° F (18°C). The foliage may be killed by frost, but the tubers should be hardy to at least 25°F (-4°C). It may be grown indoors in a 5 gallon (20 liter) container. The vine prefers part sunlight, with some protection from strong afternoon sun. Give it something to twine itself around, like a trellis. If the shoots grow too tall, don't cut them - wrap them down and around the trellis. The plant likes fertile, well-draining soil that is kept moist. Over about 40% humidity is best for this cloud forest plant. In the right conditions, it is easy to grow. By the way, i don't recommend pulling up or separating the tubers.